Dwayne Johnson could be starring in a DC Comics movie... but which one? There's a hint that Paramount is already preparing for Transformers 5 and 6. Katie Cassidy doesn't think Felicity is a challenge for Laurel on Arrow. And Mark Pellegrino theorizes about the future of Jedikiah on Tomorrow People. Spoilers now! From Marvel, the studio that brought you the global blockbuster franchises of Iron Man, Thor, Captain America and The Avengers, comes a new team — the Guardians of the Galaxy. 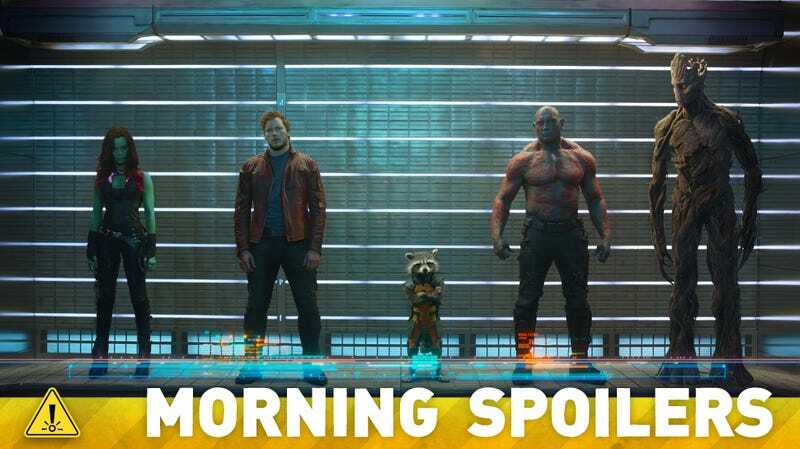 An action-packed, epic space adventure, Marvel's "Guardians of the Galaxy" expands the Marvel Cinematic Universe into the cosmos, where brash adventurer Peter Quill finds himself the object of an unrelenting bounty hunt after stealing a mysterious orb coveted by Ronan, a powerful villain with ambitions that threaten the entire universe. To evade the ever-persistent Ronan, Quill is forced into an uneasy truce with a quartet of disparate misfits — Rocket, a gun-toting raccoon, Groot, a tree-like humanoid, the deadly and enigmatic Gamora and the revenge-driven Drax the Destroyer. But when Peter discovers the true power of the orb and the menace it poses to the cosmos, he must do his best to rally his ragtag rivals for a last, desperate stand — with the galaxy's fate in the blanace. Marvel's "Guardians of the Galaxy" is presented by Marvel Studios. The film releases August 1, 2014, and is distributed by Walt Disney Studios Motion Pictures. We just had a big meeting w/ Warner Bros CEO re: @DCComics 2014 we will partner up and create the cool bad assery. We all knew when we were shooting Delivery Man that he [Jack] had done a couple of screen tests and auditions for Transformers, every day we would say: 'Any news?' Jack was actually on set one night, Michael Bay [the director of Transformers] called and he stepped off set to take the call. Everyone was looking through a window, like eager fathers awaiting the birth of their new son, and he came back in and said, 'I got it'. There was a little bit of a party that night. I don't know. I guess there's that possibility but in the sense of you have Oliver and you have Tommy and 'Oliver and Laurel' and I think at the end of the day, Oliver and Laurel are meant to be. They're each others 'ideally' first and hopefully at some point, each others lasts. No one can really ever compare to Oliver the way that Laurel sees him and I think Oliver feels the same way about Laurel. So Felicity may be there, it may be a fling, I have no idea, but you know, 'Bring it, Felicity!' Laurel has got this. I think he's a really complicated character. He's a scientist, a politician, and he truly believes, based on what he knows, that the Tomorrow People have evolved to eliminate humans. But I also think his philosophy is tainted - and fueled - by his enmity, his jealousy of his brother, for being overlooked by God, I guess, by nature, and for being the lesser of the two. So it's hard to know where he's coming from or what he really wants. There are exchanges and breakouts (emergences of powers) that need to be negotiated, and Morgan becomes a bargaining chip. And in 'The Citadel' you find that there's a compound offsite, but affiliated with Ultra, that's like a prison where we keep special Tomorrow People exclusively for the purpose of experimenting on them, using them as guinea pigs, in essence. They did set up, in the pilot, that the Tomorrow People's powers can be latent and don't necessarily express themselves in everybody,. With someone as powerful as Roger as my brother, I can't help but think that it's in me somewhere, and Jedikiah tries more and more, as the episodes go along, to acquire powers himself. His end goal, to me, is still a mystery. He's so multidimensional that I still haven't discovered yet exactly where he wants to go. Does he want to recover his brother? Does he want to gain powers? Does he want to undo Ultra himself?
. . . Right now he seems like he's in an organization that's gotten away from him. It's like he started something that's gotten bigger than him and he's trying to keep up with it.